All of the fabrics are from Amy Butler's solids line (which I also LOVE). With some cream sashing around each block, I think they will become my ALQS2 swap quilt ... well, that was my original intent, but I'm quite tempted to keep going and make myself a larger quilt from these blocks. John, these blocks are really fantastic. The fabric choices are great too. I have to find that book! John, your blocks are awesome and really effective! I love them! Maybe you need to ask for a commission on selling lots of copies of their book... we're all inspired!! I just stumbled on your blog from the ALQS site, and just wanted to say that these are fabulous! This may be my next book to hunt down on half.com! All your stuff is great - thanks for blogging everything! Great blocks. I might have to put this book on my Christmas list. What great blocks! And I relly like the way you've departed from the original colour scheme! I've leafed through that book many times but haven't bought it yet. The designs are so pretty, but I keep thinking I wouldn't make them. I may have to get it...I love your blocks! I DO like the simplicity of the designs with the solid fabric. Very nice! Good thing I am single! No hubby to ask why I bought more Kona or another book! These look great! Go Quilt Dad!! John, these blocks are great and I too must have this book. I love the use of solids they are so over looked in the quilt shop. Oh how very cool!! Your blocks look great. 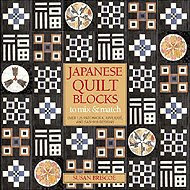 I have a brother and a good friend that are both into Asian culture and now I'll have to find that book so I can make quilts for them. Thanks for sharing! I love the combo of the Japanese block with the pastel colors - very creative and beautiful. Wow, for how simple they are they sure are sharp. I just might have to put this on my want list. They're just SOOOOO cool. i love this book...i picked it up on our anniversary trip in oregon at powells books. i love to page thru and look at all these fab blocks. cheers to you that you actually made some! I think i could easily become obsessed with blocks like these. maybe I need to order that book for myself? your blocks look perfect! you should make a larger quilt for yourself, I think. Your blocks came out wonderful! I jumped over to your blog from Loft Creations. I really like these Japanese blocks. Very nice. Hi John! That is just the best book, isn't it? I like the ones that you did. love the pink plaid block.